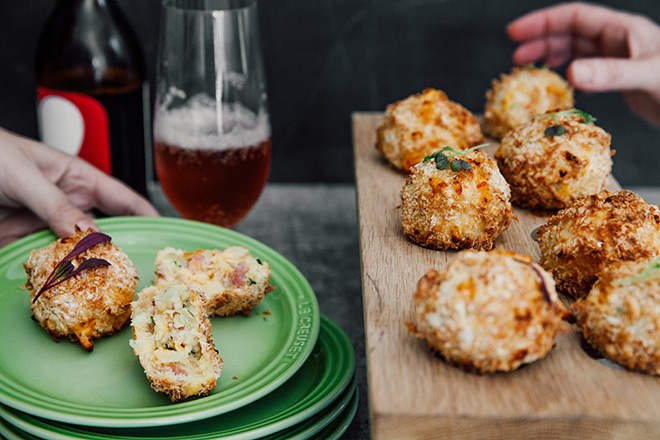 These oozy, cheesy sweet potato balls are perfect party food, especially when paired with your favourite craft beer and they are also guaranteed to keep the kids happy. But just make sure you make enough as they will be gobbled up in a blink. 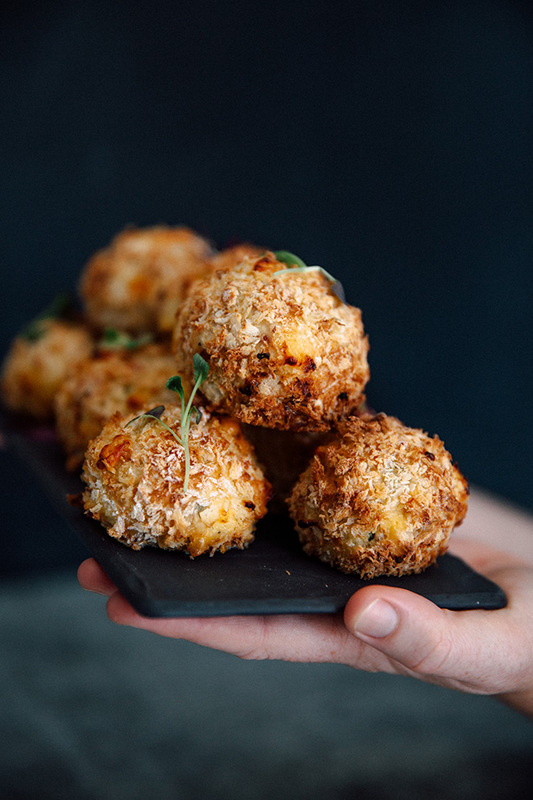 If you can’t imagine that crispy chips or these sweet potato balls of delight are possible without a rather unhealthy trip to the depths of a deep-fryer, you need to make the Airfryer‘s acquaintance. Using the Philips’ patented Rapid Air technology, the Airfryer is able to perform miracles with just one tablespoon of oil – we’ve included instructions here for how to cook with or without an Airfryer so don’t worry, nothing is stopping you from making these. 1. Combine the filling ingredients and mix well. 2. 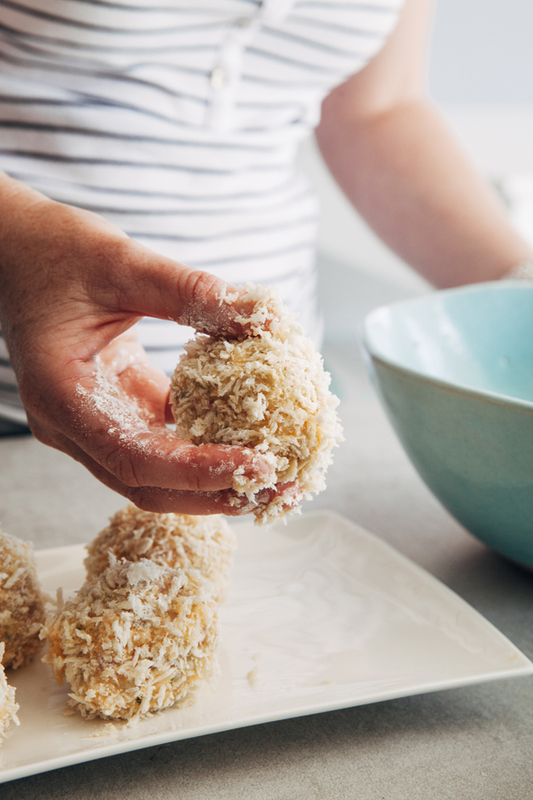 Fill three mixing bowls: one with flour, one with beaten eggs and one with Panko bread crumbs mixed with Parmesan cheese. 3. Dust your hands with flour and scoop a tablespoon of mixture into your hands. Roll into a ball and repeat with the rest of the mixture. 4. Now place the balls, one-by-one, firstly into the flour. Then into the egg mixture and finally into the Panko crumbs. 5. Using the Philips Airfryer, set the temperate to 200°C. Pour 15 ml of oil into the base of the Airfryer. Place the balls into the Airfryer – don’t pack them too tightly as you want the balls to cook evenly. Cook in batches for 12 minutes until golden brown on all sides. Continue to fry until all the balls are finished. 6. If you don’t have an Airfryer, add sunflower oil to a deep pot, but fill it no more than half full. Use enough oil so that you can submerge a small batch of food completely. Preheat the oil and test with a small amount of food. If it floats and bubbles to the top then it’s ready. Deep-fry the balls in small batches, giving them space to cook evenly for 5-7 minutes. Allow the oil temperature to recover between batches. Drain the food on paper towels. Remember to be careful, don’t leave the pot alone when you are cooking! Keen to try some new recipes like this one? Sign up for our newsletter and we’ll send you our favourites.